However dramatic, the situation is even more severe for soy producers. Because of the trade war Washington launched against China, Beijing has been hiking its town tariffs on U.S. soybeans (“Topic “US China Trade war”, The South China Morning Post). Consequently, U.S. soybean farmers had stockpiled their unsold stocks of soybeans in barns and houses, under tar, waiting for a small hike in prices before selling it. Unfortunately, the floods are turning these stocks into unsellable goods. In the same time, the floods killed more than a million calves in Nebraska, among other livestock, thus jeopardizing the farm and meat economy. What is even more worrying is that the Weather Service expects that other events of this type will occur during spring (Phil McCausland, « Midwest flooding inundates farms, rural towns to threaten livelihoods and future“, NBC News, March 22, 2019). It is necessary to understand that the risk of amplifiying weather events is not “simply” about the U.S farm belt. Actually, as the status of the U.S. as an agricultural super power is potentially impacted, this “weather risk” is in fact a “globalization-related risk”, and may include multiple propagating consequences with worldwide geopolitical, economic and financial destabilization. As it happens, in times of U.S – China trade war mixed with strengthening climate change, conventional economic tensions are now combining in direct and indirect ways. This combination triggers the state of the “long emergency” induced by climate change and the race to adaptation it drives (James Howard Kunstler, The Long emergency, surviving the converging catastrophes of the twenty-first century, 2005). Thus, these floods raise the question of the present and coming status of the Midwest agriculture in a warming and globalized world. In other words, the giant Midwest floods are human and agricultural catastrophe and a massive geopolitical risk. Beyond the mammoth scale of this historic flood, we must remember that this dramatic event is another occurrence of the multiplication of climate induced stress that affect the farm belt since the start of the 21st century. These hurdles go hand in hand with new structural difficulties due to the long drought that impacts the Midwest, from the Great Plains to California, and the return of “dust bowls”, stemming from the aridity of soils created by the lack of rain water and hotter conditions (Scientific American, Melissa Gaskill, Climate Change Threatens Long Term Sustainability of Great plains, Nov 17, 2012). During the 1930s, the era of the Great Depression, dust bowls disrupted the whole farming system and the network of rural and agricultural communities (The Center for a New American Security, Katherine Kidder, GAO: Climate Change Puts U.S Agriculture at High Risk, May 3, 2013). The return of a “dust bowlification” forces farmers to increase irrigation, and thus to intensify pressure on already overused aquifers (Blain and Kytle, The Dust Bowl Returns, The New-York Times, 10 Feb 2014). Complex water stress is also emerging as a disruptive issue because of the convergence of different kinds of competition over this crucial resource. For example, we may have rivalry between States, for instance those sharing the Colorado River (Fred Pearce, When the Rivers Run Dry, 2006). In the case of the Midwest soybean production, there are very important variables at play, varying from one region to another. These variables are the water holding capacity of soils, the technical and financial capabilities of the farmers to stock up reserves of water, and the categories of seeds they can buy. Thus, thanks to the experience accumulated over these last years while facing droughts, especially after the hard 2012 drought, soybean producers are, for the time being, able to adapt to increasingly hazardous weather patterns (Steven Wallander, Elizabeth Marshall, and Marcel Aillery, “Farmers Employ Strategies To Reduce Risk of Drought Damages”, U.S Department of Agriculture, June 5, 2017). However, the March 2019 floods seem to have largely exceeded the shock absorption and resiliency of the region. If droughts and floods are a recurrent feature of the U.S. climate history, their intensification and combination with the loss of snow packs, diminished stream flows, loss of topsoil moisture, vegetation dryness, and lack of precipitation in the context of shifting climate parameters, is congruent with the effects of climate change. Why are U.S. floods a geopolitical issue? Midwest: the long decline ? The Midwest is one of the most important agricultural regions in the world. It produces notably corn and soybeans. The U.S soybean production represents 40% of the world exports. However, its global share was 60% in 2000. It then lost huge swaths of the world market to Brazil, which expanded its cultivated surfaces during the same period (David Oppedhal, “Midwest’s ties to the global economy”, The Federal Reserve of Chicago, Chicago Fed Letter n°393, 2018) Those U.S crops are primarily used for ethanol production and animal food, especially pork and chicken. The damages stemming from the March 2019 floods are so important because of the loss of stocks. Those have been accumulated since 2018, when the effects of the trade war launched against China led Beijing to heighten its own tariff barriers against U.S soybeans, while lowering them in favour of the Brazilian production (Jean-Michel Valantin, “The US Economy, Between the Climate Hammer and the Trade war Anvil – The US Soybean Crop case”, The Red (Team) Analysis Society, October 8, 2018). In other words, the floods have destroyed the unsold part of the 2018 crops, while endangering the 2019 crops. They also destroyed the potential financial capital the stocks could have been for the farmers. And thus, the floods neutered the taxes potential the sell of the 2018 stocks would have represented for the public sector and thus for the maintenance of infrastructures (Irwin Redlener, “The deadly cost of failing infrastructure in historic Midwest floods”, The Hill, 5 April 2019). Beyond this first layer of destruction, this loss of production lowers the ability of the U.S. agriculture to reach world markets, and thus reduces the American role in the production of manufactured food. As it happens, processing food is a giant market, because it is the growing model of alimentation in cities, knowing that their size and number is also growing (Karen Perry Stillerman, “The Midwest Food system is failing. Here is why”, Union of Concerned Scientists, July 17, 2019). This rise of the processed food market for cities is due to the rapid and mammoth rural exodus in Asia, and especially in China. It triggers a rapid and immense growth of urban populations and of their needs. For example, the Chinese have to absorb a 250 million strong rural population between 2015 and 2025 (Chris Weller, “Here’s China’s genius plan to move 250 millions people from farms to cities”, Business Insider, 5 August 2015). Thus, the Midwest floods are hampering the role of the U.S. Midwest in the alimentary dimension of the massive Asian social transformation. The same dynamic is also boosting the Brazilian position on the same market, because the Chinese market is absorbing a greater share of the Brazilian production (Valantin, ibid). This situation can only bolster the project of president Bolsonaro in keeping on destroying a larger share of the Amazonian forest, in order to convert it into farmland. This combination of agricultural, commercial and financial loss is aggravating the transport infrastructure situation of the Midwest. The river, railways and road heavy bulk transport are in a very bad shape, because of 30 years of insufficient management and investments. 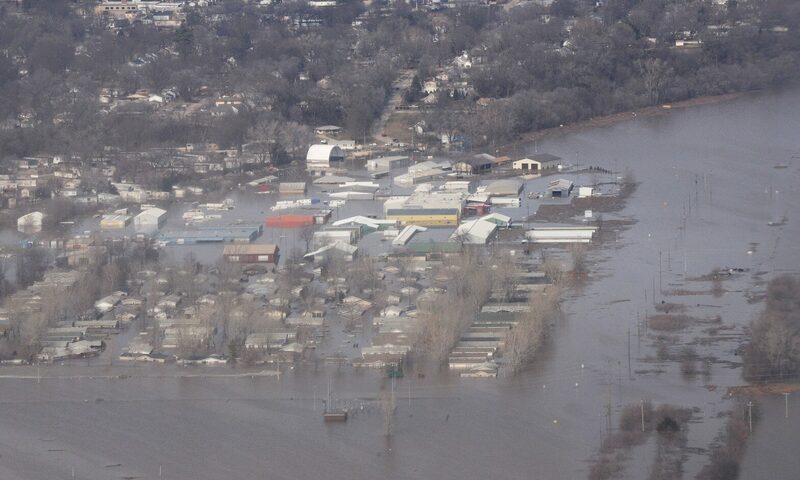 The floods are worsening the state of the vital infrastructures that connect the Midwest farmers to the world markets (David Hoppelman, ibid). Thus, the floods are literally insulating the Midwest, putting in a state of potential “forced deglobalization”, or, to the vey least, on the road to become a world agricultural periphery. Because of the intensification of climate change, this risk is heightening. As it happens, the NOAA and the U.S Weather service are predicting a multiplication of these kinds of events during the 2019 spring (Brian Donegan, “More historic, widespread flooding expected this spring in central U.S, NOAA says”, The Weather Channel, Mach 21, 2019). In the same time, the climate vulnerability of the Midwest is worsening, due to the multiplication of floods, droughts, tempests, “bomb cyclones”, and wildfires (U.S Environmental Protection Agency, “Climate Impacts on Agriculture and Food Supply”, 6 October 2016). In other words, because of the giant floods of March 2019, the very role of the U.S agriculture in the very fabric of globalization and of the U.S economy is at risk. The ruin of thousands of farmers stemming from the loss of hundreds of millions of dollars of uninsured crops could very well aggravate this process. And it may very well be a harbinger of the things to come, if the region does not find ways to adapt.